Every wedding is different! The couples' photographic requirements, their appearance, clothing, the venues, the weather and the schedule are all varying factors that make photographing a wedding in the best possible way, so interesting and a unique challenge. What makes a good wedding? More importantly than any of the above factors, it is "the people!" And that is in terms of their enjoyment and mine. A couple which are conscientious about their wedding photography will create better inspiration and job satisfaction for me and this in turn creates a better rapport. The fashion in wedding photography just now is for more candid/informal shots, or to use the buzzword: "reportage" photography. These shots are fun to do, watching and capturing people as they talk, laugh, drink, meet and mingle with each other. The best time for these shots is straight after the ceremony, when everybody is excited about meeting and congratulating the bride and groom and seeing all their other friends and relatives. They aren't concerned or don't even notice me flitting among the crowd grabbing my candid shots. For the photographically minded readers, this is where digital cameras come into their element. I can take several shots or keep shooting until I am satisfied that I have the best shot without worrying about the cost of that medium format film and processing that I used to use! 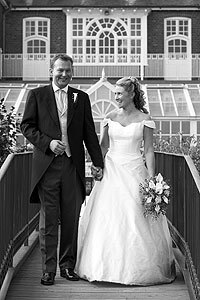 Black and white photographs are particularly fashionable just now and add a striking contrast to colour photographs in a wedding album. Wind can be a nuisance, but it can also be useful by creating movement in the shots - flowing hair, dresses and veils. When rain becomes too much for the colourful brollies or it gets too dark for even tripod based shots, then all is not lost. There is always scope inside the venues for good photographs. By using features such as flowers, staircases, fireplaces, pillars, doorways or by the opposite, avoiding any features, i.e. plain walls, good images can easily be achieved. Natural window-light is great for good looking portraits. I like to use this soft but directional light for the "before the wedding" shots of the bride, parents and bridesmaids. And this is regardless of the weather! These shots add variety to the album. Also, many venues offer good, natural window-light opportunities. An empty room, such as in the shot on the left, with good light, can provide a perfect setting. When planning your wedding, be careful to allow enough time for photography after the ceremony. The order of planning is usually to book the time for the ceremony and then book the time for the reception to start at. Sometimes however, this latter time is calculated by working backwards from the time that the evening guests are due to arrive at, thus not giving enough consideration for the photography. Generally, at least an hour is needed for photographic opportunities. By this I mean that the candid shots can be taken as I mentioned earlier, as well as the organized shots. This time can be spent at the ceremony venue and/or the reception venue - whichever suits better. Additionally, going to another special location, such as a quiet beach, a woodland or another area of beautiful landscape, with perhaps just the bride and groom, can provide an excellent opportunity for some of the best shots of the wedding. The main point is to allow enough time. It's much better to have more time than not enough! Time is precious on a wedding day and it is vital you have a photographer who is proficient at organizing those necessary group photos. Even with the current trend of more informal wedding photography there are still certain shots that are set up by the photographer and a good photographer should take these photos with the minimum of fuss and as quickly as possible. 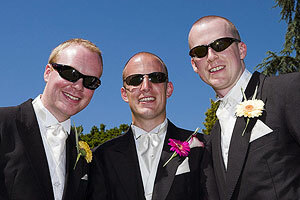 Group photos take up more time but close co-operation between the photographer and a key member of the wedding, such as the best man or an usher can speed up the organizing of these photographs. 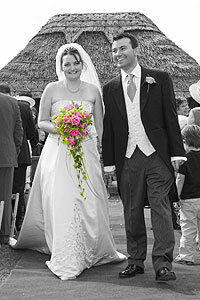 Choose a photographer who is easy to get on with and can organize with good "people" skills. Lastly a general but important tip for your wedding day: "delegate!" This is an important word for the bride and groom to remember. There are always extra little unexpected things for the bride or groom to do on the day. So rather than trying to deal with these personally, there are bridesmaids, ushers, a best man [which is their role to help!] not to mention friends and family who can all help you. It's your day so relax and enjoy it and let them take the extra load off your shoulders! I hope that this information has been of use to you.